Uncle Charlie was married twice. His first wife was Aunt Nan's sister (JosieTucker). She died when their second child was born. The baby died also. The oldest child, a little girl, died when 5 years old. He later married a 4th cousin of ours Ruby Blackman. They had 5 children. Uncle Charlie died May 1931. His wife died a few years later. His children are Floyd Marshall, Luther Littleton, Carlton Milburn, Leroy Stephen, and Ollie Grace. All live up around Fort Worth, Texas, except Carlton who is making the service his life work. E-mail written Jul 2009 to Lew Griffin from Ashley Harrel, e-mail address. E-mail written 31 Aug 2012 to Warren L. Culpepper from Barbara Gathright Evans (gd/o #1894), e-mail address. Emma E. Holveck died 17 Nov 1949 in Victoria Co., TX. John L Holveck died 19 Jul 1956 in Victoria Co., TX. ED 39, Page 14B, Galveston, Galveston Co., TX. James Nathaniel Culpepper Bible as reported by Feb 2000 FTM file, Robert Chisem "Bob" Stewart Jr.,. Biography* 21 Oct 1957� "The one thought that I want my children to remember: we have never been a fussy family. We have always managed to never get mad at each other and say things that are hard to forget. When I am gone I hope that you kids can always manage to get along and agree. Divide up what's here and treat each other right. Most of all love each other. Love will carry you thru any disagreement. Never say things to each other that are hard to forget. Josie Mary Culpepper and Charles Wilson are the parents of Arthur Anderson Wilson, Male, born __ 1931 in Wharton Co., Texas. Johnson Cemetery: Susie Culpepper Pate, wife of T. J. Pate, 22 May 1864 - 3 Jun 1925. Susie Culpepper and T. J. Pate on 26 Jun 1884 in Chattahoochee Co., GA. Fence Agent, Boards with Edward H. Carroll, Houston, 1894-1895. Sarah Jane Culpepper and Jacob Boartfield on 11 Feb 1868 in Muscogee Co., GA, Bk F-14. John Henry Clay Steely born Jan 7th 1845. James Polk Steely & Mary Elizabeth (Culpepper) Steely. Muscogee County, GA.
Henry Clay Steely married Matilda Haire, 1871,Muscogee County. Ron Harris Records, Ron Harris to Lew Griffin. Obituary* say 13 Dec 1940� Daughter of William H. & Mary A. Louisa "Lousetta" (CULPEPPER) PICKREN. 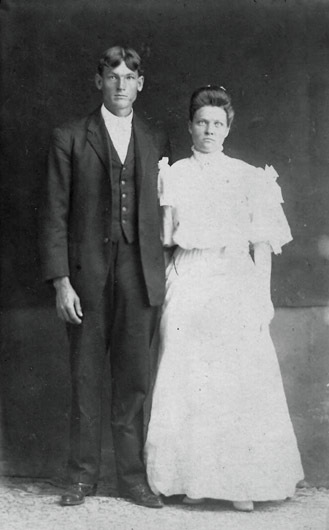 Married 10 DEC 1902 in Muscogee County, Georgia, to David Wesley CULPEPPER, her first cousin. No known issue. Died in Chipley, which is now called Pine Mountain, in Harris County, Georgia. The Culpepper Connections website reports her birth date as 11 MAY 1860, but her grave monument shows her birth year as 1859. Per Georgia Death Index: Queenie CULPEPPER, White female, died 12 DEC 1940, aged 82 years, in Muscogee [sic] County, Georgia, death certificate #30750. Pages 261-262: Queenie S. J. Culpepper, widow of David W. Culpepper of Terrell's Battery, GA Light Artillery, she lived in Muscogee County, GA.
Queenie Culpepper, Head, F, 61, wid, GA/GA/GA, None. Mary R. Allen, Sister, F, 79, WId, GA/NC/GA. Queenie Culpepper, d. 12 Dec 1940 at 82 years in Muscogee Co., GA.
Find A Grave Memorial# 14750748.